As technology advances it brings up new opportunities and subsequent challenges. The average national lead-time for tornadoes (from detection to arrival) is 14 minutes, nationwide. Researchers are working on new algorithms that may lengthen that lead time to 45 minutes within the next 3 years. A major advance, right? Absolutely. But anecdotal evidence suggests that having more lead time allows people to make bad choices: driving home from the office or picking the kids up at school - all of which increase the risk of becoming a tornado statistic. An odd conundrum. 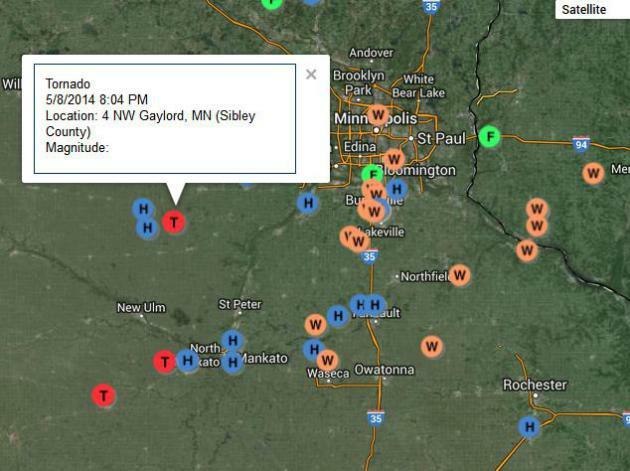 Tornado season peaks in June here in Minnesota; yesterday was just the first warning shot across the bow. Clouds linger today, the best chance of showers north of the Twin Cities. Fishing Opener starts out cool & dry, but showers push in by afternoon - highs near 60F north to mid 60s metro area. Take your favorite mom to an early brunch Sunday; clouds thicken on Mother's Day with another surge of rain, heavy at times, Sunday night into Monday. Cool, Canadian exhaust on the backside of this next storm keeps highs in the 50s to near 60F much of next week. Nights dip into the 35-43F range, but no frost. No tornadoes either. St. James Tornado Footage. Check out the YouTube clip captured late this afternoon in the St. James area - that sure looks like a confirmed tornado on the ground to me. 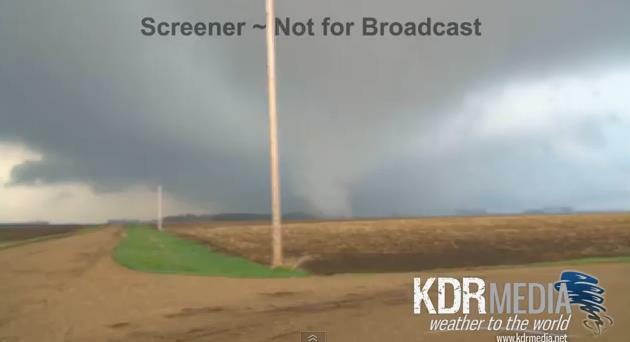 Credit: "KDR Media chaser, Kholby Martin documented a tornado in Saint James, MN this evening. Tornado touched down just to the north of by ¼ of a mile and crossed the road, tearing up the ground. 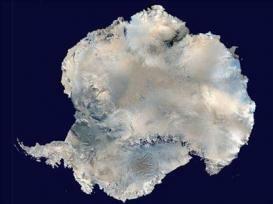 It was roughly a couple hundred yards wide yet not fully condensed." Thursday Severe Storm Reports. I counted at least 3 separate touchdowns Thursday in Minnesota, although the tornadoes in St. James and Lake Crystal were from the same rotating, parent supercell thunderstorm. The south metro got the worse end of Thursday's squall lines - most of the hail reports from the line that came through early in the day. Winds gusted to 60 mph, bringing down tree limbs, causing sporadic power outages. We just got a taste - in retrospect it could have been much worse. A lack of sunlight, and subsequently cooler temperatures near the ground, prevented the explosive instability that could have spun up large, damaging tornadoes. Click here for a list of all damage reports, courtesy of NOAA. What Is It Like To Experience A Tornado? 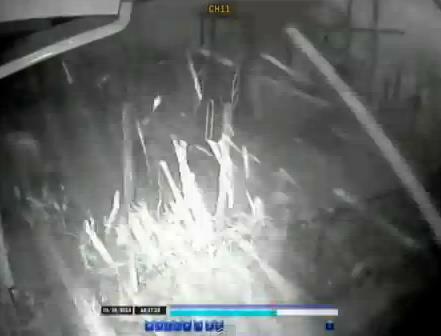 Check out this remarkable YouTube security camera video from St. Luke United Methodist Church, where a large tornado struck last week. My one take-away: that's some sturdy playground furniture. Edmond (Oklahoma) Tornado Sirens Can Talk. Just wait until one gets hacked by an Internet-savvy prankster. But overall this may not be a bad idea, go beyond a dumb-siren and have an alerting system that provides site-specific details? Sounds like progress to me, although I'll say it again, if you rely (only) on sirens you're setting yourself and your family up for trouble. 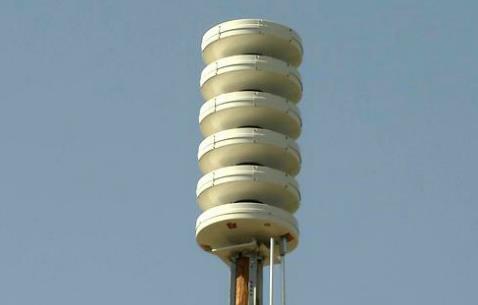 Here's a video and excerpt from FOX25 in Oklahoma City: "...Starting Wednesday, the City of Edmond activated its new voice alert systems at both Mitch and Hafer Parks. "These are meant to provide warning to those that are outside that may not have access to other warning mechanisms," said Edmond Emergency Management Coordinator Mike Magee. Magee says the voice comes out of the same speakers as the tornado siren. The siren only goes off for a tornado warning, but now the voice will warn park goers about hail, high winds and thunderstorms..."
Central Soaking. 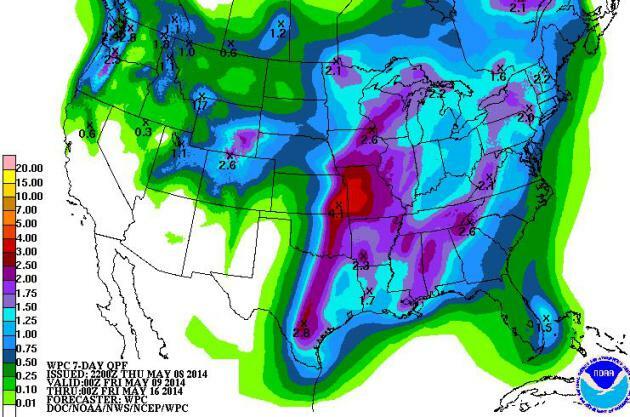 While California and Arizona remain bone-dry, a series of soaking storms drop as much as 3-4" of rain on Missouri in the coming week; 1-3" rains quite common from the Mississippi River to the Appalachians. Source: NOAA. Can't Quite Shake April. Highs reach the 60s this weekend into Monday, before falling back into the 50s by midweek as Canadian air comes surging south. A few showers Saturday may give way to heavier rain (and embedded T-storms) late Sunday into Monday - just sprinkles the middle of next week. Hey, at least it won't snow. Graphic: Weatherspark. Back To The Future: Are We About To Crack Nuclear Fusion. The world need's a new, quantum leap in clean energy technology. Nuclear fusion, similar to the process on the surface of the sun, would represent a revolution in the energy industry - but are we getting any closer? The Guardian reports; here's a clip: "...For the uninitiated, it's the kind of big idea that makes your head spin: we're talking about mimicking the process that powers the stars, heating hydrogen atoms to temperatures in excess of 100 million degrees celsius – the point at which they fuse into heavier helium atoms – and releasing energy in the process. The creation of a self-sustaining reaction here on earth would be a revolutionary moment for humanity. It would mean we'd have a near-limitless source of energy that is clean, safe and cheap. The fuel used for fusion (two isotopes of hydrogen, deuterium and tritium) is so abundant it will effectively never run out; one kilogram of it provides the same amount of energy as 10 million kilograms of fossil fuel..."
The New App That Tracks Your Carbon Footprint - And Lords It Over Your Friends. Yes, there's even an app for that, according to Grist; here's an excerpt: "Ian Monroe wants you to beat your Facebook friends at a new game: Who has the lowest carbon footprint? Monroe is the CEO of Oroeco, a recently launched web app that tracks a user’s personal impact on climate change. 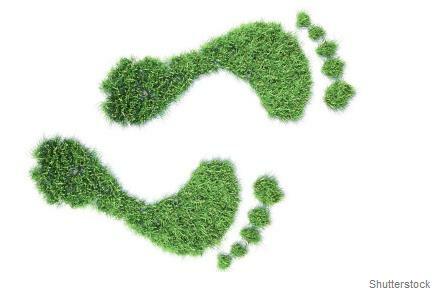 The app not only helps you quantify your own footprint — based on your spending habits, made possible through linking up with Mint.com — but by logging in with Facebook it’ll allow you to compare your carbon sins with those of your virtual community. 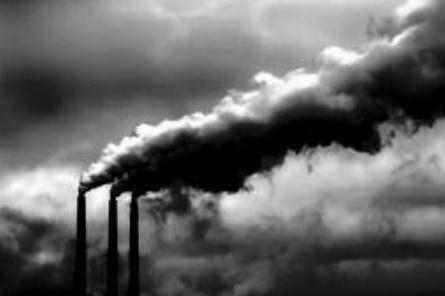 Ultimately, Monroe wants to motivate users to emit a little (or a lot) less greenhouse gas. In other words, go ahead and feel green – with envy, that is..." (Image: Shutterstock). "Godzilla Inflation". As skyscrapers get higher, so must Godzilla (to tower over all those high-rises and strike fear into the heart of mere mortals cowering below). Here's an excerpt from a story at deepseanews.com: "In 1954 Godzilla was a mere 50 meters (164 ft). In the newest movie, Godzilla is estimated to be 150 meters (492 ft). For comparison the Empire State Building in New York City stands at 381 meters (1250 ft). 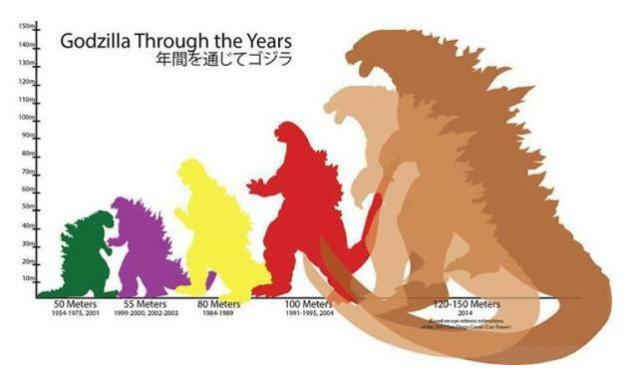 Incarnations of Godzilla went from 13% of the height of the Empire State Building to nearly 40% of the height in just 60 years. It took cetaceans 55 million years to go from 2.5 meters (8.2 ft) to 30 meters (98 ft) in length..."
69 F. high in the Twin Cities Thursday. The forecast of upper 70s was a bust. Repeated waves of showers and T-storms kept us cooler than anticipated; we never broke out into the sunny, warm sector for any length of time, which also prevented the most extreme T-storms from firing near the metro area. 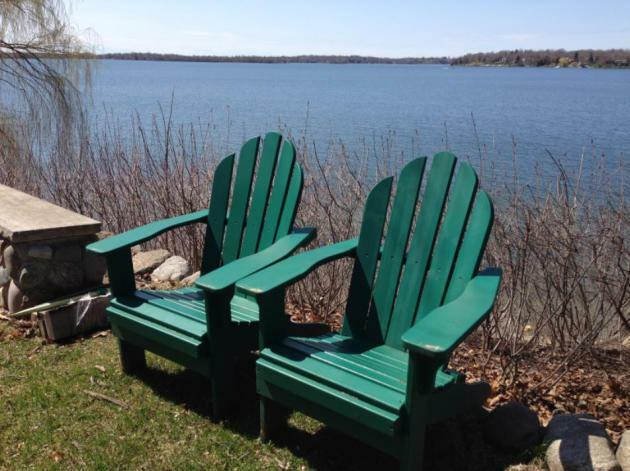 67 F. average high on May 8. 78 F. high on May 8, 2013. .58" rain fell at KMSP yesterday. Florida Finds Itself In The Eye Of The Storm On Climate Change. South Florida will see numerous challenges in coming years related to rising seas, ever higher storm surges, and salt water encroaching on fresh water supplies just inland. Here's an excerpt from The New York Times: "...A new scientific report on global warming released this week, the National Climate Assessment, named Miami as one of the cities most vulnerable to severe damage as a result of rising sea levels. Alton Road, a commercial thoroughfare in the heart of stylish South Beach, is getting early ripples of sea level rise caused by global warming — even as Florida’s politicians, including two possible contenders for the presidency in 2016, are starkly at odds over what to do about it and whether the problem is even real..." (Image: NASA). 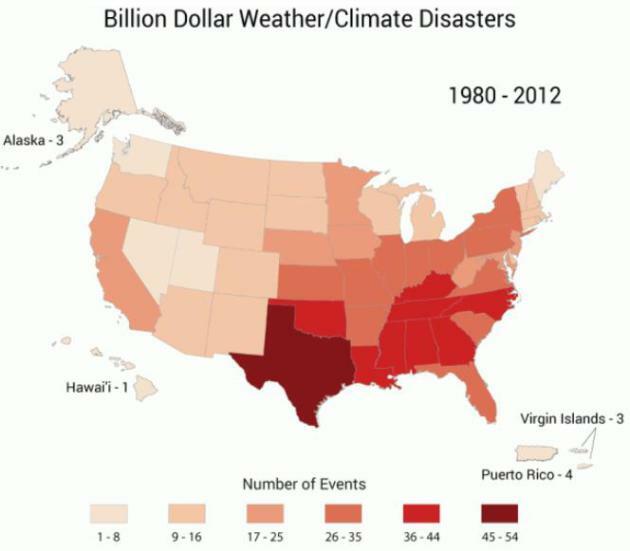 The Southeast U.S. Has Had More Billion Dollar Disasters Than The Rest Of The Country Combined. Here's a clip from a story at ThinkProgress: "Heat. Drought. Sea level rise and invasive species. The Southeast and Caribbean will escape few of the impacts of climate change, and the regions are already grappling with how to deal with many of them, according to the just-released National Climate Assessment. The assessment calls the Southeast and the Caribbean regions “exceptionally vulnerable to sea level rise, extreme heat events, hurricanes, and decreased water availability.” Many of these impacts are already being felt by Southern states. 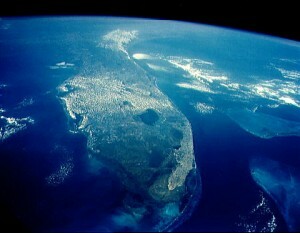 Florida, in particular, has struggled to adapt to sea level rise and increased frequency of intense storms, Jennifer Jurado, Director of the Natural Resources Planning and Management Division in Broward County, Florida, told ThinkProgress..."
Graphic credit: National Climate Assessment, NOAA NCDC. Now A "Pollen Vortex"? Wild Weather May Mean Allergy Nightmare. The polar vortex certainly delayed allergies across most of the USA, but we seem to be rapidly making up for lost time. Here's a clip from NBC News: "...Susan Kosisky, a microbiologist and chief of the United States Army Centralized Allergen Extract Laboratory, reports that daily average pollen counts from her laboratory in Silver Spring, Md., have been 50 percent or below what is normal for this time of year, which she attributes to cold temperatures. But before you throw away the tissues, experts say the slow start could mean a more intense wallop. “It will be a shorter period by a number of weeks but you will see it all hitting very intensely,” says Dr. Shulan..."
Million Year Climate Record A Step Closer After Australian Expedition. The Guardian reports on new attempts to tap ice core samples to get an even longer record of changes in Earth's climate system; here's an excerpt: "Antarctic science's holy grail of a million-year climate record is a step closer following a successful ice-drilling expedition. Australian Antarctic Division (AAD) scientists have returned to Hobart with two tonnes of ice cores dating back 2,000 years and say a record of the climate over a million years could be achievable within a decade..."
Can The Kochs Hold Back History? Here's a snippet from an Op-Ed at The New York Times: "...What this shows is that you can buy a lie, but you can’t make that lie the truth. Over the last nine months, three exhaustive studies have shown that climate change is happening now, and will continue to unfold in real time, with record droughts in the American West, rising seas along the Atlantic coast, and global megastorms so catastrophic they will divert CNN from the missing plane. The climate experts in these studies are the gold standard — from places like the National Academy of Sciences and the Royal Society. 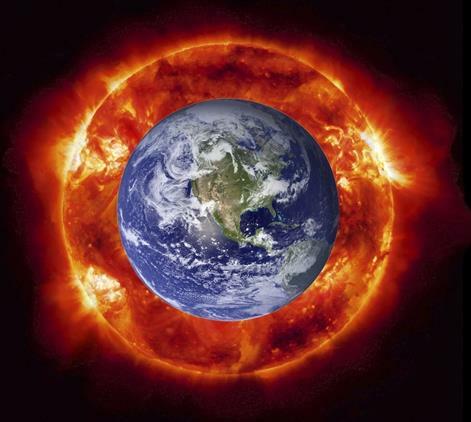 They are not political hacks looking to spin something..."
The New Climate Change Argument: Global Warming Is Good For You. Here's a clip from a story at The Guardian: "...Has the denial camp has found its new meme? 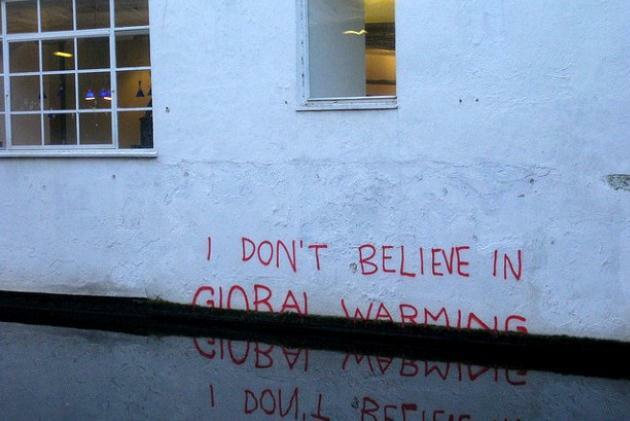 One that admits the warming is happening but insists – contrary to the overwhelming evidence – that it's beneficial? Hardly, says Harvard University professor and science historian Naomi Oreskes, co-author of Merchants of Doubt. "One thing these folks have done for a long time is have a kind of repertoire of arguments, and, depending on circumstances, they trot out different ones," she said. "This is not new. This is recycled..."
Image credit: Matt Brown, Flickr.